The sea is a new and nefarious obstacle for players in Pillars 2, so here's a guide on how to handle the new naval exploration and combat. 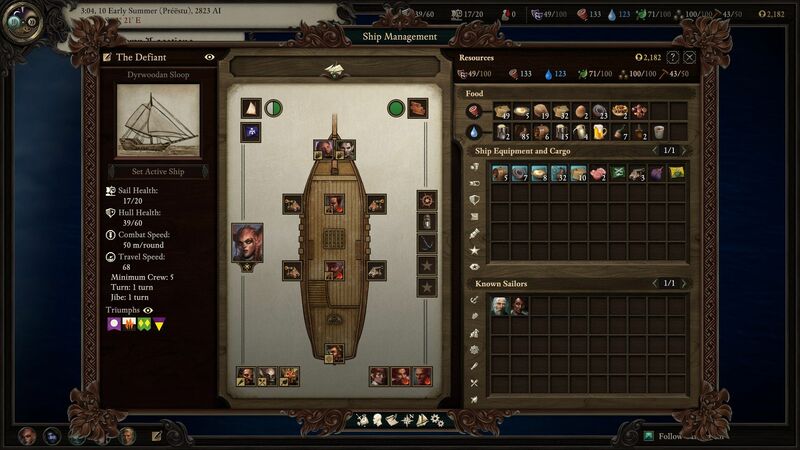 As mentioned in our Pillars of Eternity 2: Deadfire hands-on preview, naval exploration adds a major new layer to Obsidian's role-playing game. 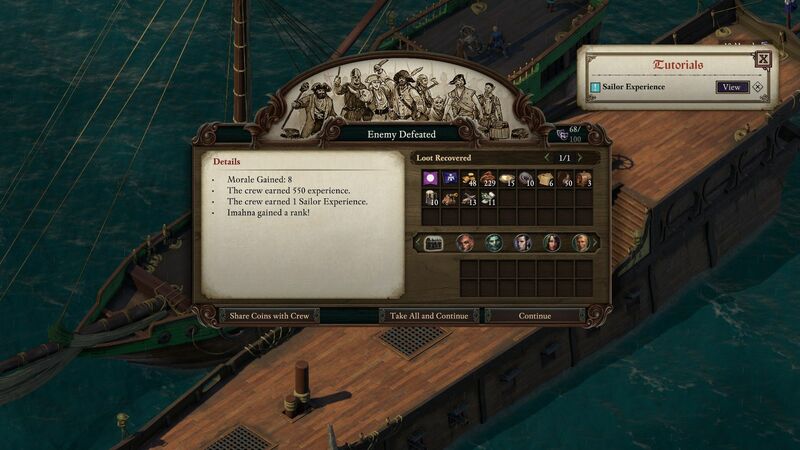 Not only is the world in Deadfire larger, necessitating the naval traversal narratively, ship combat and crew management are a crucial part of the Deadfire experience. The Deadfire Archipelago is a dangerous place, beyond the giant God walking across the land and water, so players need to be prepared to defend themselves from the many enemies that sail the seas. This combat system isn't just a reskin of ground combat, though. There are a handful of layers to this new gameplay mechanic and we're here to help you make sense of it all. There are two slots for miscellaneous upgrades on your starter ship, The Defiant, and four places for canons. There are multiple ships you can upgrade to and those numbers will change as you get to larger vessels. 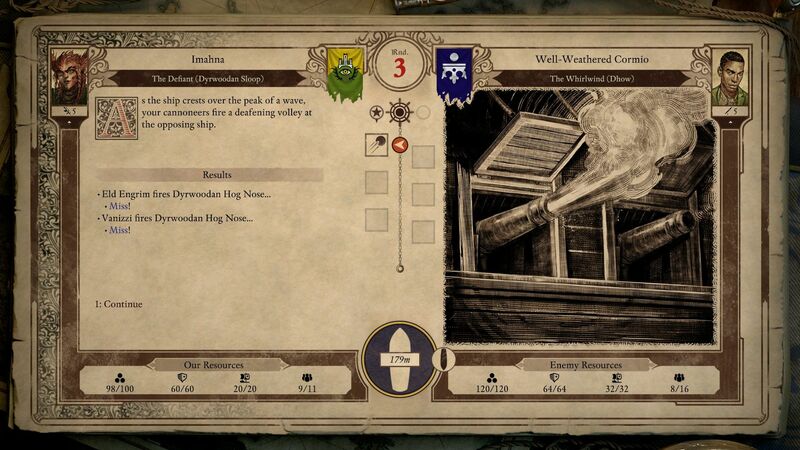 In addition to the things that allow the ship to operate on water, there are the things need to keep your crew engaged, healthy, and happy in Pillars of Eternity 2: Deadfire. Food and drink are consumed over time as time passes in the world of Deadfire and the different types of food and drink you supply will determine your crew's wellbeing. 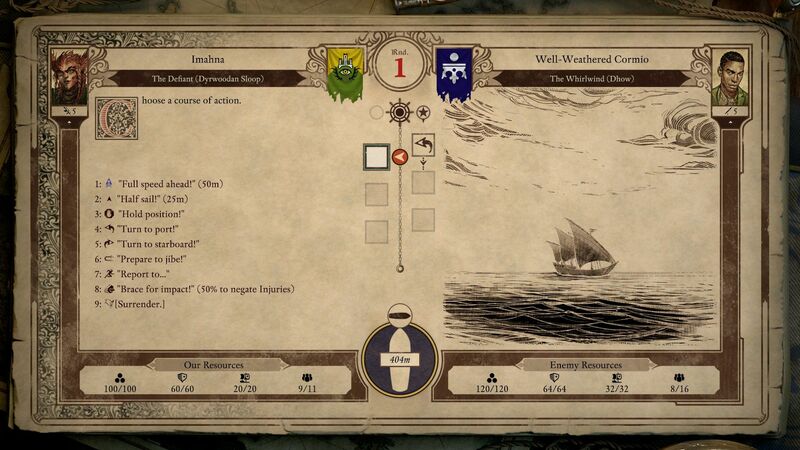 The positive and negative effects vary item by item and determine if the crew's morale rises, falls, or stays neutral as you go about your regular sailing. Each person you recruit in Pillars of Eternity 2: Deadfire will specialize in one or more roles and you'll know which by looking at the stars they have next to each job. Your crew can gain experience as you sail, fight, and experience crew events, but that experience only applies to the jobs they're capable of. In addition to your crew getting better over time, you can hire better crew members for your ship at various trade areas and ship supply spots. Crew members can get injured over time, so make sure to look at you ship management tab every so often. If someone is hurt, forcing them to continue work will hurt performance and could result in that crew member dying. Move them to a reserve spot and move another crew member into their station to keep things moving smoothly. Ammunition is self-explanatory and you do not want to get caught in a battle without an ample amount to use against the enemy. Hull health is the most important in ship combat. When it reaches 0, your ship sinks and it's game over. As sail health plummets, so will your movement option efficiency (next section). Once it reaches 0, your ship won't be able to move. When you click the lower-middle ship symbol in combat, you'll be able to see your crew. As the crew number falls, more and more stations will be unmanned and your ship will be tough to manage. Once you run into a ship in the world map or a ship runs into you, the conflict begins. It's laid out on parchment paper-like menus like the skill checks that happen on foot, but the actions you'll take are different and more involved. The first three in the bunch are pretty self-explanatory. The next two are as well, but if you have trouble remembering which way is which, the arrows on the options point in relation to the ship symbol in the lower-middle of the screen. While looking at that, you'll also know what direction the enemy ship is facing and which side of your ship it is on. This is important when deciding to fire port or starboard canons. "Jibe" means to flip the ship around in the oppositive direction. For instance, if the enemy ship is port side and you've already fired the canons there, you can jibe and fire the starboard side canons after the action is completed. Depending on your, ship, crew, and how the wind blows, the jibe action could take longer or fail altogether. "Report to..." is very important when it comes to your ship's efficiency and survival as the fight goes on longer. As you take damage, crew members will be injured. You can always click the lower-center ship icon to look at your ship crew and canons, along with the enemy ship layout. "Report to..." allows you to move crew around (multiple per action, if needed). If your cannoneer is injured, his efficiency at this station will suffer. Use this action to get him time to heal and get someone better suited to fight at the station. Cannonball - focuses on hitting the hull. Rarely hits sails or below deck crew. Chainshot - targets sails. Low chance of hitting abovedeck crew. Grapeshot - focuses on the abovedeck crew. Low chance of dealing sail damage. When this happens, you must assign a crew member to address the event before it causes even more catastrophic damage or outright ends the battle and your game. For example, a damaged hull will result in 10 hull damage and a loss of repair items if not resolved in time. When this happens, use the "Report to..." to move reserve units to the special event. The more you put there, the faster it is fixed You can also move crew members from their stations to the event, but that means their station will be unmanned for the time it takes to fix the problem. If you sink the enemy ship, there will be spoils to share. Gear can go into your party's inventory or stash, but the coin can be shared with the ship's crew. They won't be content if you just take all the plunder for yourself, so be careful how you dish out the spoils during your travels. If you don't feel confident you can take on the enemy ship, you can flee or surrender. Fleeing will negatively impact morale a lot if the enemy is inferior. If fleeing fails, combat will begin, but you'll be able to surrender. This will cost morale and a great deal more. Enemy captains will demand payment to survive, often involving a collection of food, beverages, money, and other things. Occasionally, there will be moments that work like the special skill checks that happen on land. For instance, you may run upon a destroyed ship that has yet to sink. 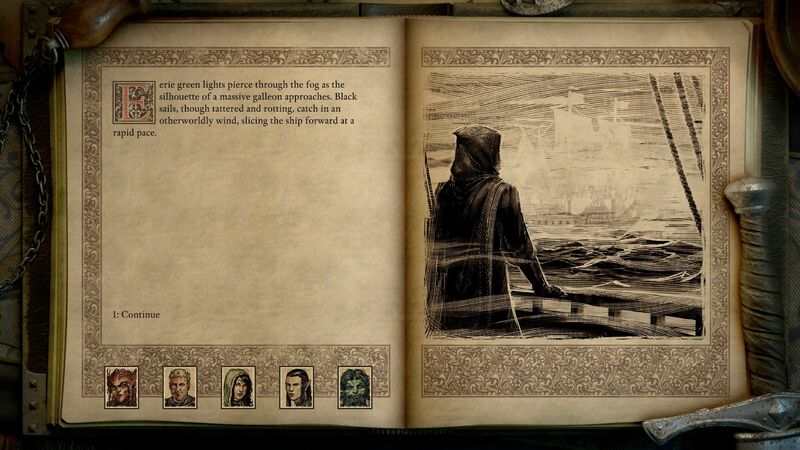 You may also sail into a storm and have to decide how your crew prepares the ship for rough water, determine how the crew manages their sea-sickness, ask a companion for assistance calming the crew's minds, or other things. These ships won't attack and offer an opportunity for trade when you're not near land. This could be important if your crew is suffering because you forgot to bring enough food or drink, but you could also decide to attack the merchant's vessel. Head over to and bookmark our Pillars of Eternity 2: Deadfire walkthrough and guide hub, where we break down everything from legendary weapons to companions, sidekicks, and more.